Cecile and Tetcha, my two sweet blogger friends gave this award to me and I truly appreciate their thoughtfulness and friendship. I’m honored to be one of the recipients of this award. Being a blogger for two years now and a mom for 12 years gave me a different level of satisfaction for being these two personalities. 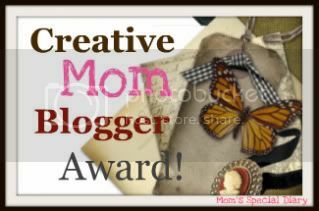 It’s my pleasure to pass on this award to the following creative mommy bloggers: 1. Juliana of Pinay Wahm 2. Mira of Random Thoughts. 3. Liza of Mommy's Little Corner 4. Tita Bheng of Beyond My Quiet Zone 5. In-In of Whatever Comes To My Mind. Congrats on your awards! Hope you had a great weekend.